Y. Zhang et al., “Expandable cardiovascular progenitor cells reprogrammed from fibroblasts,” Cell Stem Cell, 18:368-81, 2016. To repair cardiac damage after a heart attack, numerous clinical studies have experimented with injecting a variety of potentially therapeutic cells into patients, but very little of the introduced material sticks around. 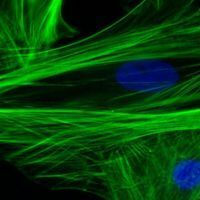 It’s thought these cells act indirectly—via paracrine mechanisms—to regrow heart muscle, and the benefits have been modest at best. 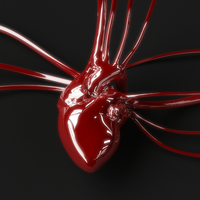 So Sheng Ding of the Gladstone Institute of Cardiovascular Disease and the University of California, San Francisco, has been working on another idea: produce progenitor cells that will grow into new heart tissue. 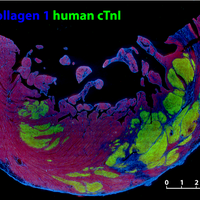 Ding’s team succeeded in generating easy-to-grow progenitor cells—either from induced pluripotent stem cells or directly from fibroblasts—that could become any of three lineages in the heart: cardiomyocytes, smooth muscle, or endothelium. 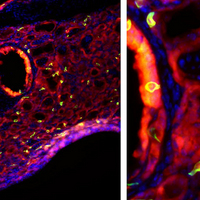 Injecting these cardiac precursors into mice with infarcted hearts staved off declines in heart function. 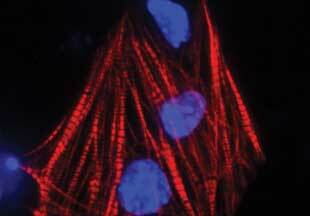 Lab-grown cardiac precursors have been produced before, says Christine Mummery of Leiden University Medical Center, but they’ve been difficult to expand or have required an activated oncogene to grow. In Ding’s study, a cocktail of transcription factors did the job, and the cells proliferated readily. “It’s amazing they were able to get so many [cardiomyocyte] cells” from the precursors, says Stanford University’s Joseph Wu. “I think people will be encouraged there are independent ways of making cardiac progenitors that can expand,” Mummery says. Wu calls the findings “exciting,” especially the production of precursors directly from fibroblasts. He adds that more research is needed to replicate the results and see how the cells behave in humans. Ding says his group is now focused on optimizing the protocol for human cells.